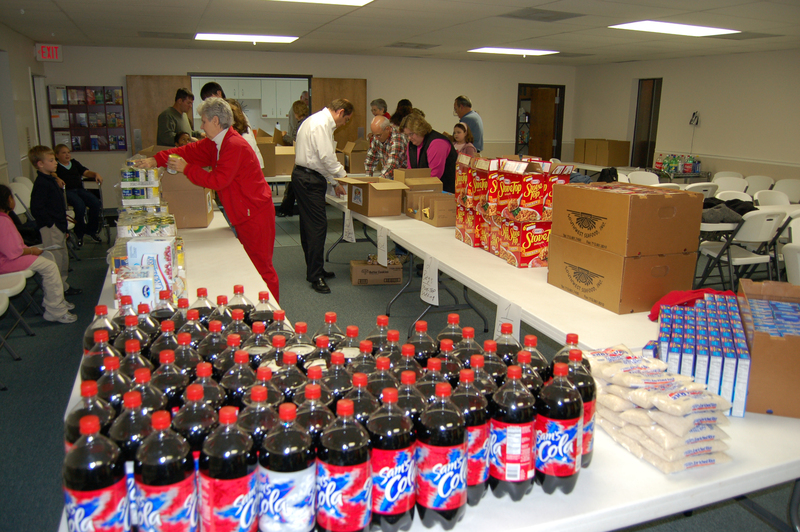 The Eastern Shore church prepared 36 Thanksgiving boxes for distribution in November. These were given to people in the commnity who were in need. Many were taken to our local schools where school counselors distributed to students in need. Each package contained ingredients for a large Thanksgiving meal and a gift card for a Butterball Turkey. Stuffing, vegetables, macaroni and cheese, cornbread mixes, cranberry sauce and soft drinks made for a fine meal. We had plenty of help from our young people! from the Eastern Shore church of Christ. Boxes were then sealed and stacked for pickup. Our Thanksgiving project was not only good for those receiving the boxes but also for the Eastern Shore congregation. Participation came from every age group and saw great work especially from our youth. These young people helped to package the boxes but also helped to deliver them. This is an important teaching tool to remind our youth that there are people among us who truely struggle each day. The important Christian characteristics of generosity, compassion and giving are on display for all to see and learn from. We are especially appreciative of James and Jenny Jessee who organized our Thanksgiving project. They have done this before in other locales and were willing to help us with our project here. A similar project is in the works for Christmas so be listening for details.